The Diversity and Evolution of Ectomycorrhizal Fungi of the Guineo-Congolian Rainforest project will revolutionize understanding of plant-symbiotic ectomycorrhizal (ECM) fungi in tropical Africa. Using standardized specimen sampling techniques, state of the art DNA sequence-assisted diversity documentation, and phylogenomic and phylogenetic analyses, the project will examine the origin and diversity of ECM mutualisms in the ancient, primeval Guineo-Congolian rainforest. The study will focus on the ECM fungal communities associated with the leguminous tree Gilbertiodendron dewevrei, which forms monodominant forests that are a key feature of the region, along with other ECM plants in mixed associations across multiple sites. Survey plots will be established and sampled over multiple years in the Dja Biosphere Reserve and Korup National Park of Cameroon. Ectomycorrhizal fungi will be sampled using morphological and molecular methods, and novel biogeographic analyses will determine the evolutionary histories of the taxa in a global context. Our approach, combining traditional specimen-based sampling with high throughput sequencing, will provide the most complete diversity data to date on ECM fungi of Afro-tropical forests. This project will also produce the first robust dataset to allow comparison of intercontinental tropical ECM fungal communities in corresponding ecosystems. This project will elucidate an ecologically important and poorly studied guild of paleotropical fungi. 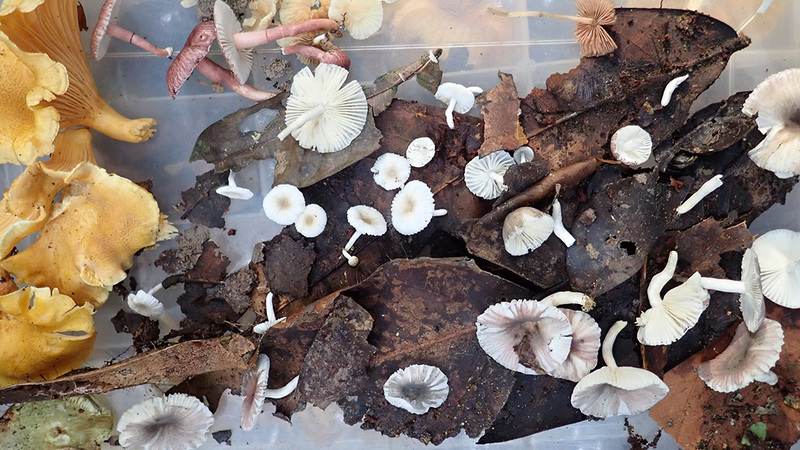 An estimated 100+ fungal taxa new to science will be discovered and formally described. Recognition of these taxa will greatly inform broader macrofungal systematics and evolutionary research. The research will enhance understanding of fungal biogeography in the Gondwana-derived Afro-tropical and Guiana Shield regions, and form the basis for addressing broader questions concerning the mechanisms controlling diversity and community structure of tropical ECM fungi and their host plants. This project is potentially transformative in that if the ECM fungi associated with closely related ECM host plants of the Afro-tropics and Guiana Shield are shown to have a common ancient origin, such results would fundamentally impact understanding of the evolution, global biogeography, and local adaptation of ECM symbioses. Additionally, genome-based high throughput sequencing will develop new, phylogenetically informative loci that could transform macrofungal systematics in general. Overall, the project will document many fungal taxonomic novelties from a poorly explored African region, provide DNA sequence data that will greatly enhance global reference libraries, and provide the first rigorous biogeographic analysis of Gondwanan tropical ECM fungi. The project will also provide training of students and indigenous assistants, internet-based information sharing, and public outreach.